Dolby unveils video room solution, integration with BlueJeans and Highfive -- each of which has its own product news, too. 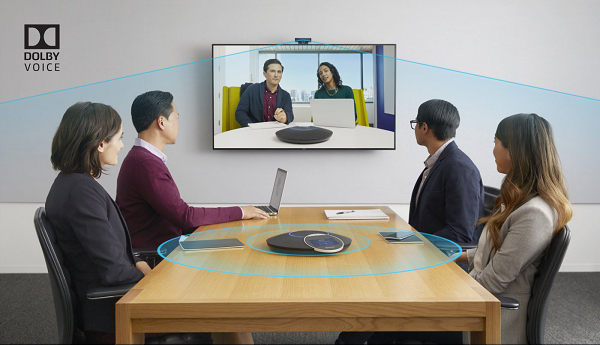 Long known for its audio solutions, Dolby Laboratories today announced it's taking what it's been doing with that technology for meetings and collaboration experiences to the next level with Dolby Voice Room, a video conferencing solution aimed at huddle rooms and other small meeting spaces. Dolby designed the solution with simplicity in mind, wanting IT to be able to deploy the video conferencing system in as little as five to seven minutes, Andrew Border, VP of the Communications Business Group at Dolby Laboratories, told me in a No Jitter briefing. "There's a tension in the market with video-enabled solutions. The IT team wants something that's easy to use and deploy, but also cost effective," he said, noting the system's $4,500 price tag. As shown below, at the center of the Dolby Voice Room solution is the Dolby Conference Phone, for audio conferencing, of course, but also serving as a control center for the video conferencing component. The solution also includes the Dolby Voice Camera -- a 4K camera with a 100-degree field of view -- and Dolby Voice Hub for administration and provisioning. System intelligence is another important component, Border said. "We thought about what can be done to make the meeting experience more natural, in such a way that the burden is taken off the user by making the system more intelligent." To that end, the system uses a Dolby-developed face tracking algorithm to frame the video view automatically, and then hold that frame. When people get up and move about the room, the system "gradually" reframes the view without requiring human intervention. "The camera [adjustment] is subtle; it's not aggressive," Border said. Additionally, Dolby Voice Room features high dynamic range (HDR) video mapping for adjusting the video image according to lighting conditions, and a whiteboard view, which uses the video conferencing camera to deliver a flat view of any room's old-fashioned dry-erase whiteboard to remote meeting participants. Dolby will bring Voice Room to market initially through its partners, Highfive and BlueJeans Network, each of which announced their integrations this week. Since Dolby built Dolby Voice as a dedicated appliance, the BlueJeans version will look and feel different than the Highfive version, Border said. Dolby Voice Room will be available later this spring, with the ability to use the solution as a SIP endpoint to follow later this year. Companies already using Dolby Conference Phone will have the option of purchasing the additional camera and Hub components. Pricing is not yet available for that setup. Besides the Dolby Voice integration, Highfive announced interoperability with meeting hardware like SIP devices, new pricing plan options, professional services, and other enhancements. BlueJeans announced a redesigned meetings platform experience. This and the Dolby Voice integration follow on last week's news that it has partnered with Voicera, which offers an artificial intelligence-based voice assistant.